WHO (2012). 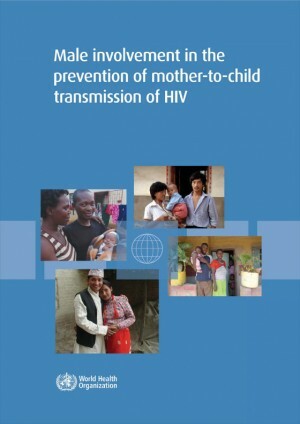 Male Involvement in the Prevention of Mother-to-Child Transmission of HIV. World Health Organization: Geneva, Switzerland. In 2009, 370 000 children became infected with human immunodeficiency virus (HIV) globally. Nearly all of these children acquired HIV through mother-to-child transmission. Ninety per cent of them live in sub-Saharan Africa. The World Health Organization (WHO) and Joint United Nations Programme on HIV/AIDS (UNAIDS) guidance calls for a global response that is centred on, and responsive to, the realities of women’s lives. Because there is ample evidence documenting the impact of men on the various components of prevention of mother-to-child transmission (PMTCT) programmes, male involvement has been recognized as a priority area of intervention within this woman-centred approach. An extensive review of the public health literature was conducted to assess the current level and nature of male involvement and to identify opportunities for the advancement of constructive male engagement in PMTCT. The geographic focus of this paper is on sub-Saharan Africa. This paper highlights the documented benefits of men’s engagement in PMTCT of HIV, barriers to men’s engagement, and promising strategies to involve men, as well as conceptual and methodological issues that merit further consideration and research. The paper reveals that despite overwhelmingly positive attitudes towards PMTCT programming among men, their engagement remains very low. Barriers to men’s participation include fear of knowing one’s status, stigma and discrimination. Perhaps the most significant obstacles are the conceptual and policy barriers that inadvertently support men’s exclusion from PMTCT and other reproductive health services. The historic institutionalization of reproductive health as women’s health has contributed to men’s perception of clinic spaces as “women’s spaces”, and reproductive health as women’s work, and has generally produced health services that are not welcoming of men and couples. This paper argues that to maximize the health outcomes of PMTCT for children, women and men, we must move beyond seeing men as simply “facilitating factors”, to enable women to access health-care services but view them as constituent parts of reproductive health policy and practice. This paper demonstrates that men’s constructive engagement can and does yield positive results for the health of women, children and families.